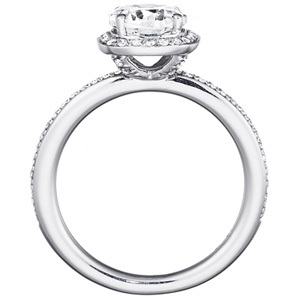 Your bride to be will treasure the dramatic sparkle of this diamond engagement ring. 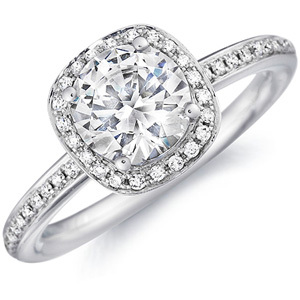 The center stone is lovingly encircled by a cushion frame set with diamond accents. The diamond studded band increases the wattage of this high-voltage masterpiece. Center diamond is not included in price. 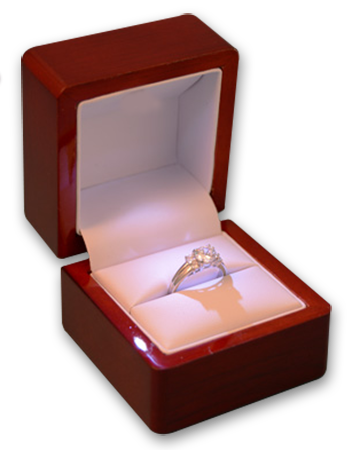 Click on a diamond to add it to your ring. This perfect engagement ring is a Lauren Cushion Frame Halo Setting with Comfort Fit Shank (.22 ctw.). The unique design of the Lauren Cushion Frame Halo Setting with Comfort Fit Shank (.22 ctw.) could come with a princes cut diamond or a cushion cut diamond. You can view all our Halo engagement rings, Vintage engagement rings, Round Cut engagement rings, Cushion Cut engagement rings, Harry Winston Inspired engagement rings.We have a full collection of engagement rings. Create the perfect ring by matching a white gold, yellow gold or platinum engagement ring setting of your choice to any of our thousands of diamonds.